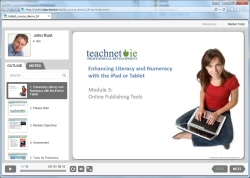 For Spring 2019, TeachNet are offering four online courses, to help you and your school achieve effective ICT integration into teaching and learning. TeachNet’s online courses bring together the expertise of St. Patrick’s College DCU and the practical approach of our course authors. All TeachNet courses are created “by teachers, for teachers” using the best interactive e-learning technology and provide practical ideas for using ICT creatively in the classroom. The feedback from participants, since first offering online courses in 2008 has been very positive and we are confident that the TeachNet courses provide a superior user experience. Delivered online, this course can be taken anytime, anywhere between January 14th and May 31st 2019. Each of our courses provide for approximately 20 hours of study with downloadable course notes and online discussion forums moderated by TeachNet mentors. We also provide tailored support by email and on the phone when required. Please Note: All our courses require fast broadband Internet access (Min of 5mb recommended) and participants need to be familiar with using the internet, downloading and installing software.